• HAMAS, a terrorist group based in the Gaza Strip, West Bank and Syria, draws financial backing from supporters and sympathizers in New Jersey. 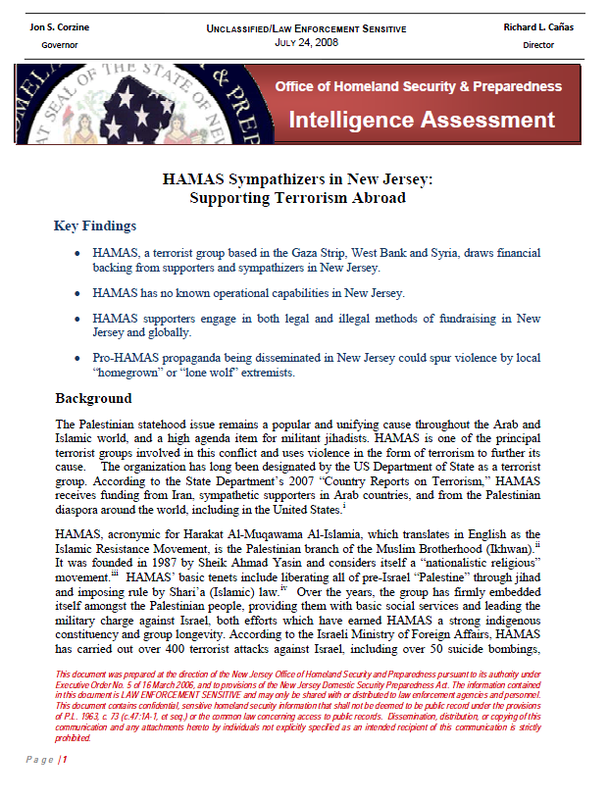 • HAMAS has no known operational capabilities in New Jersey. • HAMAS supporters engage in both legal and illegal methods of fundraising in New Jersey and globally. • Pro-HAMAS propaganda being disseminated in New Jersey could spur violence by local “homegrown” or “lone wolf” extremists. Although HAMAS maintains a presence in the West Bank, the Gaza Strip continues to be the HAMAS stronghold. On September 11, 2005, Israel officially completed its withdrawal from Gaza, relocating over 8,500 Gazan settlers and ending its military presence there.vii By January 2006, HAMAS had won 76 of the 132 seats in the Palestinian Parliament.viii An uneasy coalition with the Palestinian group FATAH degenerated into internal strife and HAMAS took complete military and political control of Gaza. The reaction to this turn of events gave rise to an international boycott against the group. In the meantime, as recently as April of this year, HAMAS was reported to be in the middle of the “most significant military buildup in its history…”ix Since June 6, 2008, Israel and HAMAS have agreed on a temporary truce, though reports indicate it might not last much longer. New Jersey has a presence of HAMAS sympathizers. Nationally, the Palestinian population in the United States is conservatively estimated at more than 72,000. Approximately 4,000 of those live in New Jersey, with the largest number residing in Passaic County (est. at 1241), some of whom support HAMAS. x These figures reflect only those who participated in the 2000 census and the actual Palestinian population in the region probably is higher. In addition, interest in the ongoing Israeli-Palestinian conflict draws the concern of members of the broader Arab population in New Jersey, some of whom support the Palestinian cause, including HAMAS. Support for HAMAS in New Jersey has manifested itself in several ways. The group’s backers have employed legitimate means of gaining support, such as spreading propaganda and promoting the cause intellectually through public gatherings and use of the Internet. In addition, HAMAS activists have raised funds through charities, such as the Holy Land Foundation (HLF), which was identified by the federal government in 2001 as having funneled millions of dollars to HAMAS for material and logistical support purposes. HLF’s assets were frozen by the US Treasury Department in December 2001, and several of its members have since been indicted. HLF had an office in New Jersey.xi Globally, HAMAS is known to engage in criminal activity, such as drug and counterfeit goods trafficking.xii While it is not clear how much money HAMAS raises through these means, it has been estimated to be in the millions. It is possible that HAMAS sympathizers in this region may also engage in such activity on the part of HAMAS. HAMAS supporters in this region may also be taking active leadership roles in their communities. A prominent example is Imam Mohammad Qatanani, who was well regarded in the local Palestinian community. Now, Qatanani is fighting deportation on the grounds that when he initially applied for U.S. citizenship in 1999, he may have misrepresented his ties to HAMAS. Israeli officials have presented a confession from Qatanani in which he admitted to being a member of HAMAS.xiii Questions regarding the Qatanani case are illustrative of the need to increase our intelligence collection vis-à-vis HAMAS, its supporters and presence in New Jersey. HAMAS supporters in New Jersey will continue to send funds to the group to bankroll both its military and social efforts in the Palestinian territories, possibly in increasing volumes in response to a deteriorating situation in the Middle East. These funds will likely be processed through “humanitarian” organizations run by or sympathetic to—but not directly connected with—HAMAS. Most of these funds will likely be used for weapons procurement, which appears to be HAMAS’ top priority over and above the group’s social service programs, which will thus likely get a smaller proportion of the incoming monies. In light of the US Government’s failure to win clear criminal convictions against individuals who have been prosecuted for supporting HAMAS in the past, including HLF, the group’s backers will likely become more creative and sophisticated in their future fundraising efforts in New Jersey. HAMAS supporters will also continue to focus on recruiting and disseminating propaganda. As stated in the organization’s charter, HAMAS intends to target intellectual classes and youth groups through education, the media, and religious centers. The organization also intends to continue focusing its efforts on the general Muslim population that it considers to be an integral part of its community (ulama).xiv As HAMAS’ propaganda continues to spread locally, it could inspire and possibly spur a “homegrown” or “lone wolf” extremist to violence in New Jersey. Currently, as a group, HAMAS does not appear to have the operational capacity or intent to engage in violent terrorist activities in the United States. The organization believes all Muslim lands should be liberated, but its primary cause remains “Palestine.”xv Further, HAMAS leadership in the Middle East may believe that it does not serve the organization’s interests to directly confront the United States. However, the group could lend assistance to other terrorist organizations and countries with which it has strong relationships, such as Hizballah and Iran, in perpetrating terrorist attacks against US or Israeli interests. Even in a support role, though, it is unlikely that HAMAS would engage in any direct attacks on the Homeland.